An Ice model driven by NH insolation but adjusted for dust albedo does a pretty good job at reproducing the last 8 glacial cycles. Details are described below. Simulated Ice Volume model in blue compared to measured LR04 Ice Volume data. Prior to the Mid Pleistocene Transition (MPT) roughly one million years ago, glacial cycles followed a simple 41Ky obliquity cycle. This can be understood if Northern and Southern Hemisphere ice sheets waxed and wained independently, because the average of the NH summer and SH summer peak insolation follows obliquity. Raymo et al. suggested that the East Antarctic Ice sheet melted back to bare land prior to 1M years ago. The ebb and flow of the southern ice sheets (Patagonia included) with SH precession simply offset that in the Arctic because the precession component is always out of synch between North-South summers. The average of both just leaves the in-synch obliquity component which is why it dominates the Global Ice volume data before MPT. Hubers (2) also pointed out that the integrated summer insolation which he calls total “caloric summer” also follows obliquity. The reason for this is due to Kepler’s law. Conservation of angular momentum during the earth’s elliptical orbit ensures that each hemisphere’s precession enhanced maximum insolation has a shorter summer by several days. So when calculating the total energy received at 65N or the poles, the precession term simply cancels out. Both the above effects are summarised in figure 1., which also highlights the role played by eccentricity in modulating peak insolation at each pole. Figure 1. Maximum and total solar insolation calculated at the poles during last 600,000 years. Both the total annual insolation and the N-S asymmetry clearly show the underlying effect of the 41,000 obliquity signal. STOT is equivalent to total calorific summer and (Smax NP – Smax SP) leaves just the obliquity signal which affects both hemispheres equally. Raymo proposed that once Antarctica became permanently covered in ice after MPT the symmetry was broken, and NH insolation thereafter became the dominant driver of glacial cycles. 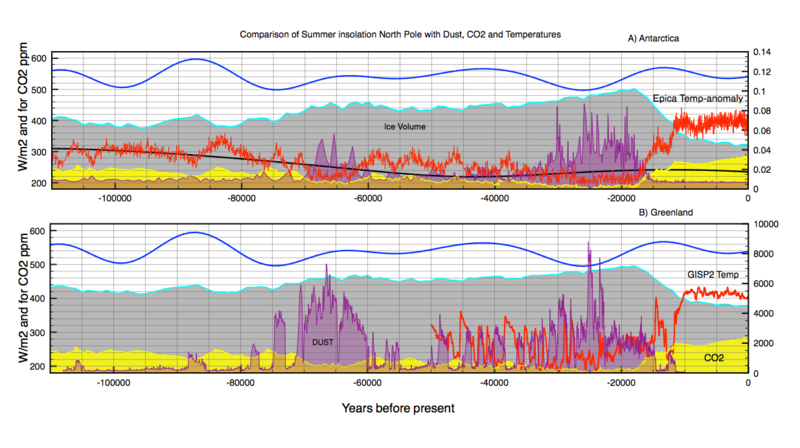 So why didn’t ice ages simply follow the NH Peak 65N insolation? This is the unsolved mystery of ice ages as to why they apparently switched instead to a 100Ky “eccentricity” cycle. Eccentricity modulates the strength of the precession term and each interglacial does indeed coincide with eccentricity maxima. However, no-one has properly explained why other larger NH insolation peaks fail to have much effect, while far smaller peaks eventually succeed in melting back the ice sheets (figure 2). In 2006 Gerard Roe published a paper “In defence of Milankovitz”  where he showed a good qualitative agreement between the rate of change of the SPECMAP Ice volume fit with Arctic summer melting, as measured by maximum insolation at 65N. The agreement though was too good, partly because the SPECMAP fit itself had used the 65N insolation for dating the stack. The LR04 stack however, contains many more geographically spaced cores which are independently timed. When I checked the LRO4 derived DV/DT against N-pole summer insolation I found that there was indeed a correlation but the agreement was not nearly as good as Roe’s. However what Roe did demonstrate is that NH peak insolation is a major driver in the ablation and growth of the ice sheets, but cannot on its own explain the ice volume data. So what is the missing link needed to explain the dynamics of recent ice ages? Ellis and Palmer proposed that the missing link was the dust albedo effect. As glaciations deepen and CO2 levels fall below 200ppm. The arid conditions cause less snow which combined with CO2 starvation cause die back of boreal forests and increased dust deposits over the ice sheets lasting thousands of years. You can see this effect in figure 2. They propose that this decreases the ice surface albedo sufficiently such that the next NH peak summer is sufficient to rapidly melt back the ice sheets caused by a chain reaction ice albedo feedback. One difficulty with this explanation is that Greenland dust data is only available for the last 200,000 years and so the assumption needs to be made that Antarctic dust is also a proxy for NH glacial deposits. This seems a reasonable assumption at least for for the last glacial period (figure 3). Figure 3: Comparison of Greenland GRIP data with EPICA Antarctic data. Willeit and Ganopolski  have also recently highlighted the importance of dust albedo and snow ageing during the last glacial cycle. “The surface energy and mass balance of ice sheets strongly depends on the amount of solar radiation absorbed at the surface, which is mainly controlled by the albedo of snow and ice. They used an “Earth system model” – CLIMER-2 and were able to reasonably well model the last glacial cycle. Yet the details still remain obscure because such complex climate models are black boxes. Surely there must be a simpler physical explanation for the slow growth and sudden collapse of ice ages. Does dust enhanced albedo play the critical role in recent glacial cycles? To answer this question, I decided to try to develop a simple dust model based loosely around the original Imrie and Imrie Ice model . First I tried a very simple equation. where b is a nonlinearity constant between ice growth and decay, S is NH insolation, is the ice albedo which depends on dust levels. I have tried two versions for so far. The first assumes that a critical accumulation of dust over one glaciation is the prime driver once NH induced ablation starts, whereas the second assumes that a critical threshold 15,000 years ago is required. Scale factors are needed to match insolation in W/m with Ice Volume in Benthic . I used b = 0.03. The model is written in Python. Figure 4. Shown below are the model results in blue compared to -DV/DT data in red. The upper plot shows again -DV/DT in red compared to the 65N Insolation. Below this is the LRO4 ice volume data and dust data scaled for comparison. The agreement of the albedo weighted NH insolation with -DV/DT is now much better. But the real test of the model though is to reproduce the Ice Volume results by integrating forwards in time based on the start value 800,000 years ago. The only input for this is the new NH insolation and the recorded EPICA dust data. Figure 5 shows the result. Figure 5. A comparison of the Model A simulated Ice volume by integrating -DV/DT forward in time This is compared to the the actual LRO4 Ice volume data. Overlaid in red is -DV/DT proving that the integration is sound. In general the agreement is remarkably good considering the time scale. However we see two problems caused by overcompensation for dust albedo in the early cycles. Perhaps Antarctic dust was not fully coupled to that in NH. The results from model b) which includes a 15,000 year time lag in dust contributions are shown in figures 6 and 7. Figure 6. 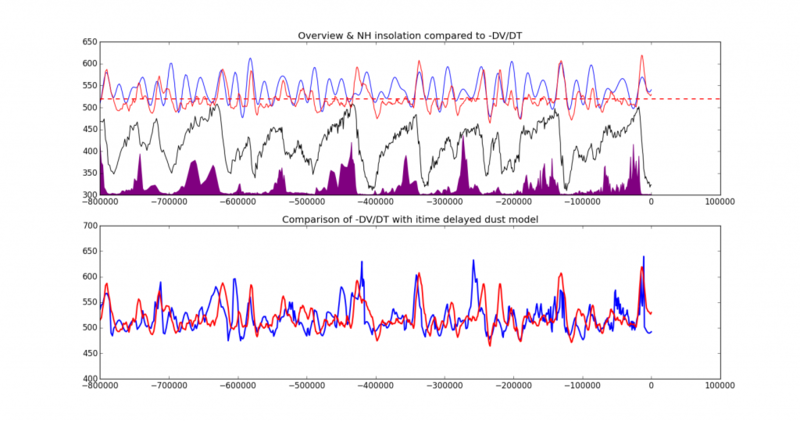 Overview for the delayed dust albedo model. 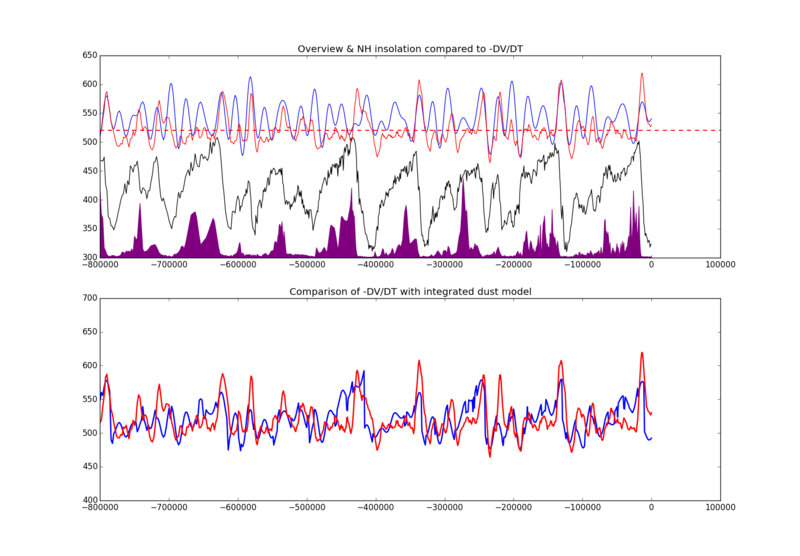 The comparison of -DV/DT for ice volume and Dust induced albedo is shown below. Figure 7: Simulated Ice Volume results by integrating the delayed dust albedo model B forward in time. This is compared to the actual LR04 ice volume data in black/red. as in Figure 5. The agreement is better, but we see potentially another problem in that the holocene is now not so well modelled due to latent effects of dust from LGM. However, the timings and basic shape of glacial cycles are reasonably well represented. So I am fairly hopeful that a solution to the mystery of ice ages can be found. Imbrie, J., Hays, J.D., Martinson, D.G., McIntyre, A., Mix, A.C., Morley, J.J., Pisias, N.G., Prell, W.L., and Shackleton, N.J., 1984. The orbital theory of Pleistocene climate: Support from a revised chronology of the marine ? 18O record. In Berger, A., et al., (eds), Milankovitch and Climate. Hingham, MA: D. Reidel, pp. 269–305. 4K (your second sentence) should be 40 or 41 K.
“I have tried various two models” Perhaps delete “various”? Inyeresting. I will have to read it again. Yes, Ganopolski has made several papers based upon that same glaciogenic argument. However, the dust in the Greenland ice sheet has been identified by isotopic analysis, as being from the Gobi desert region. So none of Ganopolski’s arguments make much sense. The dust originated from the Gobi because CO2 levels got so low, that the whole of the Gobi region became a shifting-sand CO2 desert. And the great dust layers on the Loess Plateau in China demonstrate how much dust the Gobi was producing. However, no-one has properly explained why other larger NH insolation peaks fail to have much effect, while far smaller peaks eventually succeed in melting back the ice sheets (figure 2). Of course it has been explained, by Peter Huybers, by Chronis Tzedakis, and by me. It just takes a long time to sink, perhaps a generation. NH peak summer insolation is not decisive to trigger an interglacial unless is above 549 W/m2 at a time when obliquity is >23°. Otherwise it is a third order factor that can help produce an interglacial when synchronized with obliquity. Second order factor is global ice volume. This was observed by Parrenin in 1998. The more global ice volume the better. If LR04 d18O > 4.90 per mil and obliquity > 23° you get an interglacial, no matter the value of NH insolation. High global ice volume values strongly promote interglacials at high obliquity. And first order factor is obliquity. Every interglacial takes place at an obliquity window (>23°), and every interglacial ends ~ 6 kyr after obliquity drops below 23°. No obliquity window no interglacial. That’s a hard rule. Interglacials are still taking place at a 41 kyr cycle, they are just skipping beats. The 100-kyr cycle is not an interglacial cycle. There are 11 interglacials in the past 800,000 years. Do the math. Slightly less than 82 kyr because twice in that period two interglacials took place separated by 41 kyr. Don’t believe me? You have already seen this, yet you are still unconvinced. Milankovitch got it right when he defined caloric half summer as the half of the year when every day receives more insolation that any of the other half. It was tough to calculate without computers, so he did it for one year every 10,000. After Berger 1978 Milankovitch theory was corrupted with the idea that NH 21st June insolation was good enough, and easier to incorporate into the first model by Kutzbach in 1981. Every single problem of Milankovitch theory can be tracked to that corruption of the theory. Despite NH peak summer insolation being unable to explain interglacials, everybody, including you, holds to it even if they are told it is wrong. Why? Milankovitch theory has absolutely no problem and explains perfectly well interglacials, including their anomalies, like MIS 11c and MIS 7e. Your dear dust is a consequence, not a cause, exactly the same as CO2, and together with albedo and other factors (increased volcanic activity, rising sea level), are just part of the positive feedback pack towards quick melting associated to a very high ice volume. Interglacial flow chart. A simple flow chart incorporates the criteria deduced from the past 1 million years of glacial cycle. Interglacials do not take place when obliquity is below 23°. If obliquity is above 23°, interglacials require an ice volume higher than the equivalent to 4.55‰ benthic ?18O or a very high 65°N July summer insolation, above 549 W/m2. If insolation is lower, interglacials require an insolation above 521 W/m2, or very high ice volume, around 4.90‰ ?18O. There are two cases why interglacials fail to take place. The most common is case 1, when ice volume is not sufficiently high (8 cases). Case 2 is when there is sufficient ice but insolation is too low, associated to very low eccentricity (3 cases). We do really need to rely less in models and more on the evidence. Models are built on assumptions that are generally wrong. So why would a high ice volume trigger an ice sheet collapse, rather than a retreat back to a more stable volume? It makes no sense. If the ice sheets were happy at 80% of maximum volume, why not just retreat back to the stable 80% level. Also the ice age cycle is NOT 100 ky, and NOR is it 82 ky. It is a variable cycle that started off as about 90 ky, but has increased to about 115 ky. And these cycle lengths are the same as the equivalent clusters of four or five precessional cycles. Quite clearly the controlling factor in recent ice ages is precession, not obliquity. On the Image below SGY stands for the Seasonal Great Year. Please remember that this is an article about an ice-age model based upon dust-albedo feedbacks. It is not an opportunity for you to post vast diatribes about your obliquity theory. So what do you think is wrong with including dust-ice-albedo as a terrestrial feedback system, that assists in the initiation of interglacials? Thanks Javier for a clear explanation. I agree that total caloric summer for both poles depends only on obliquity. Likewise the asymmetry between NH and SH also follows obliquity. 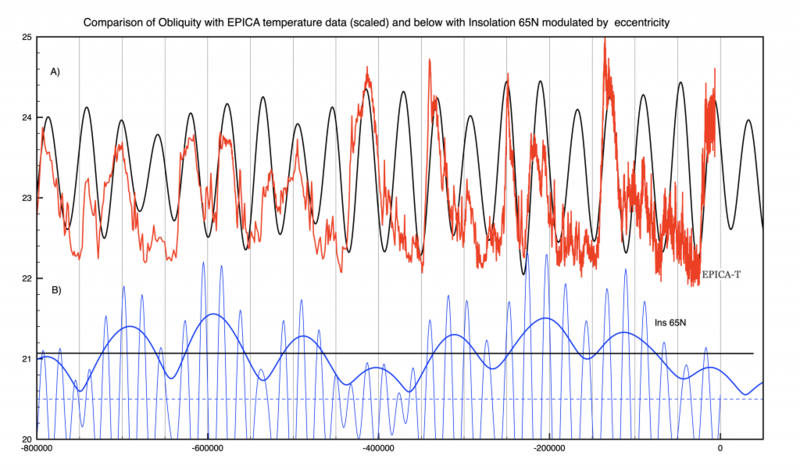 I like the plot of Epica temperatures aligned with obliquity delayed by 6,500 years. It is impressive. So your rule works, but it doesn’t say why it works. For example why should there be a threshold in ice volume needed for an interglacial? If you believe ice albedo feedback then each glaciation would end up as a snowball earth. Likewise falling CO2 is a feedback. So I need a physical explanation as for why the rule works. I am not wedded to the dust albedo factor but it does offer a possible physical explanation for why the rule works. Dust peaks whenever dry arid conditions ensue which is normally at the end of a glacial period. My simple ice model kind of works although it needs some fine tuning. How do you explain the Rho result that DV/DT ~ Insolation65N , or is it just because timings are artificially chosen to align? So your rule works, but it doesn’t say why it works. I think it is pretty obvious. We go back 2 Myr and obliquity alone was enough to melt the ice and produce an interglacial. Then the planet continued cooling and ice build-up was too much for obliquity to overcome, as it has a 6 kyr delay and only 20.5 kyr of rising phase. On practical terms about 10 kyr to get the job done and so much ice melts slowly. So obliquity became dependent on high latitude North summer insolation. Since precession period is about half of obliquity’s, it means that half of the time they are properly aligned and cooperate to get the ice melted. In MIS 3, for example they were not properly aligned so no interglacial was possible. But when eccentricity is low and no interglacial is produced the planet accumulates a huge amount of ice, so the workload doubles the next time. Around 1 Ma the amount of ice was so much from one interglacial to the next that a new factor entered the scene. Otherwise interglacials might have stopped occurring or would have rarely taken place. Parrenin observed this factor that he called ice-sheet instability. High ice volumes strongly promote interglacials. This is an observation. The explanation is not albedo. Albedo is a puny beast. The great majority of albedo is atmospheric, and the increased albedo from ice can be easily compensated by a small reduction in cloud cover, and we know glacial periods are arid. Ice sheets become unstable when they grow too large. We know this because of Heinrich events that produce armadas of icebergs at ~ 6000 years intervals. Younger Dryas is a Heinrich event. Ice shelves become prone to collapse, and when ice volume is very high it means that a great part of the ice is lying below current sea level, on continental platforms. The factor that is most effective at melting ice is not insolation, and not dust. It is water. At the same temperature water melts the ice several times faster than air. And high obliquity delivers the increased solar energy right at the water at high latitudes. As the ice melts the sea level rises and more ice melts, so the sea level rises more. The rest of the factors (CO2, dust, volcanic activity, albedo) also contribute but are much slower. Melting by rising sea levels at the base of glaciers and ice sheets probably accelerates their speed and collapse. This new powerful negative feedback by ice volume has as a consequence that interglacials become warmer the higher ice volume is prior to their termination. Check it. Thus temperature oscillations have become wider in the last 800 kyr and the climate is more extreme. 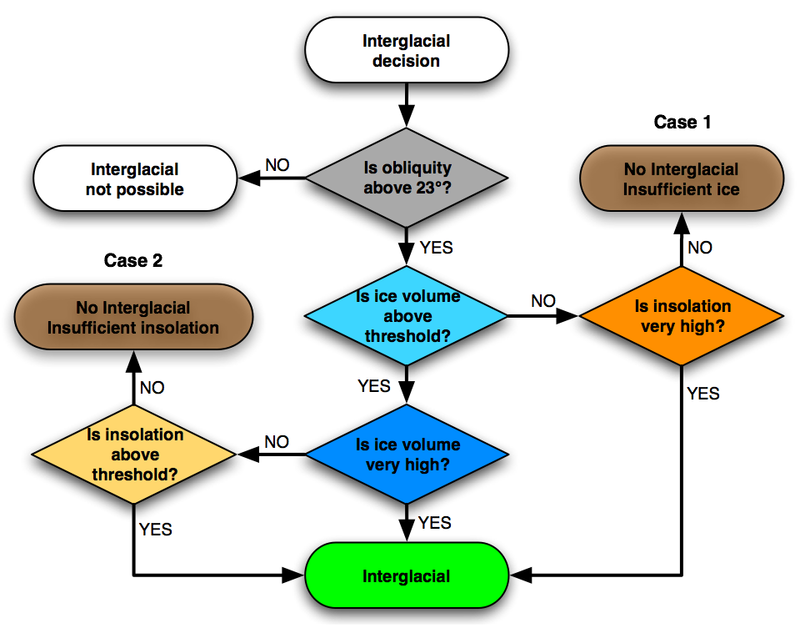 For example why should there be a threshold in ice volume needed for an interglacial? Because the time allowed to melt the ice and cause an interglacial before obliquity starts falling is limited by the obliquity cycle. The speed of the melting is directly proportional to the amount of ice. More ice, faster melting. Ice lower than the threshold and the melting is too slow to do it before the obliquity window closes. Higher than threshold and the melting will take place fast enough to produce an interglacial before obliquity starts falling. If you believe ice albedo feedback then each glaciation would end up as a snowball earth. Likewise falling CO2 is a feedback. So I need a physical explanation as for why the rule works. I believe ice albedo is hugely overestimated. The Arctic melting from 1995 to 2007 was nothing short of spectacular. 30% of summer sea ice has been lost. The ice albedo feedback must be several times higher now, yet sea ice has not melted in 10 years. The planet is about atmospheric albedo, not ice albedo. Possible explanations greatly outnumber correct explanations, that’s why hypotheses abound. One has to be extra-careful about causality and correlations. Dust is a consequence of glacial periods, so the correlation can not support that dust is a cause, as it is already explained. Feedback factors are defined as consequences that modify the gain of the response. By that definition dust is a feedback. The result is not very impressive. The peaks that clearly align are the peaks when an interglacial was produced, and in most cases that means that obliquity, 65N insolation and ice volume were working together. How do you explain the lack of effect that 65N insolation had on ice volume at 375 ka? or at 450 ka? or at 175 ka? The calorific summer (total energy for the whole summer) is not the full answer, because of the low angle of the spring and autumn Sun, as per my longer post below. Low elevation insolation cannot warm high albedo ice sheets, and so most of that ‘all summer’ obliquity insolation you are relying upon is reflected away. In addition, the full calorific summer tends to mask the effects of precession, because spring and autumn precession are in opposition – while obliquity can act for the whole summer throughout the entire precessional cycle. This makes the effects of precession look weaker. But if it is only high elevation mid-day mid-summer Sun insolation that can be absorbed by high albedo ice sheets, then it is the effects of midsummer insolation that are paramount in initiating interglacials. It is precession that can deliver that high intensity midsummer insolation, not obliquity. And precession is strongest when eccentricity is high, which is why we get the strong correlation with the ~100 ky eccentricity cycle. Ice sheets become unstable when they grow too large. We know this because of Heinrich events that produce armadas of icebergs at ~ 6000 years intervals. Younger Dryas is a Heinrich event. Ice shelves become prone to collapse, and when ice volume is very high it means that a great part of the ice is lying below current sea level, on continental platforms. The factor that is most effective at melting ice is not insolation, and not dust. It is water. I have thought about this before – see The straw that broke the camel’s back. High ice volume is the same as low sea levels. Once the land bridge forms between Siberia and North America the only access to the Arctic Ocean is through the North Atlantic. Sea levels at LGM were 120m lower than today. High obliquity moves the tidal flows further north because the moon’s orbit spans a higher latitude range, likewise the sun. A lunar standstill produces the maximum tides at high latitudes every 18.6y. The increased ebb and flow of tides coincident with obliquity enhanced summer insolation is sufficient to accelerate ablation of the ice sheets. The sea rise feedback you describe then helps complete the job. Following your comment I decided to plot the same thing compared also to eccentricity modulated NH insolation at 65N. The deepest glaciations always coincide with low eccentricity. Sea levels at LGM were 120m lower than today and Ice volume second only to the Anglian. However the next glaciation will be the most severe the world has ever seen because eccentricity reaches the lowest levels since 2.4 million years ago. As can be seen, interglacials do not follow obliquity on many occasions, like 660, 450, 370, 170, and 50 ky ago. It is clear form these missing cycles, that whether one champions obliquity or precession as the dominant orbital cycle, that a terrestrial feedback system is also required to initiate an interglacial. And since all of the interglacials appear to be associated with NH precessional-Milankovitch maxima, it seems clear that this feedback system has to operate only in the NH. (Otherwise, some interglacials would be triggered by a SH precessional maximum.) So it is unlikely that a global feedback like CO2 can be involved with interglacial initiation. What feedback systems are there, that only operate in the NH? The most obvious and likely is dust-ice-albedo. The NH contains all the major continents, and therefore all the major ice sheets, and so the albedo of the NH will change much more than the SH during the ice age cycle. Not only did Antarctica never lose its ice sheets during interglacials (as can be seen today in the Holocene), but it could not be darkened much by dust either. All the major dust sources, like the Gobi, are in the NH – while the SH had to depend upon the puny Atacoma desert for its dust. It might be interesting to graph the albedo changes of the NH and SH during the ice age cycle, but they will certainly be greater in the north than the south. One possible reason for the change from obliquity interglacials before the MPT, to eccentricity-precessional interglacials afterwards, is the differential insolation absorption characteristics of bare earth and ice. So what is required, to warm an ice-sheet dominated world, is high intensity, high angle of elevation, precessional insolation. The king of intense insolation that is delivered in midsummer, by orecession. And THAT, I believe, is why the world changed from obliquity interglacials to precessional interglacials, at the MPT boundary, some 800 ky ago. The difference was the increasing size of the northern (mainly northern) ice sheets, which passed a certain size-threshold. In which case, we require at least 15 ky years of dust layers within the ice sheets, that can ‘rise’ to the surface as the interglacial proceeds. The length of the dust deposition era is limited by the precessional cycle. Any more than 15 ky, and we are back into the previous precessional cycle, which would have already intiated an interglacial. (The theory assumes that both dust and a high-precession Milankovitch ‘Great Summer’ are required, to trigger an interglacial). The only exception to the 15 ky limit, is when eccentricity, and therefore precession, are so low, that there is no strong Milankovitch ‘Great Summer’ and no strong precessional insolation, to trigger an interglacial. In which case the climate has to wait another ~22 ky, for the next Milankovitch maximum. See the position 270 ky ago in fig 2. Plenty of dust had already being deposited, and the conditions were right for an interglacial. But the next Milankovitch ‘Great Summer’ was so weak, than nothing happened. The world had to wait patiently for another 22 ky, when a much stronger precessional maximum triggered the interglacial. I like the term Great Summer because it is very descriptive. When the NH has its Great Summer, the SH is having its Great Winter – so the Great Summer is like an Annual Summer, except it lasts for about 22 ky. So what melts the annual winter snows in Canada – the summer insolation in Canada, or the ambient temperature in Argentina? Logic dictates that it is NH insolation and NH feedbacks that control interglacial initiation, and not a global feedback like CO2.